WAILUKU — When Tanya Johnson’s brother got cancer in the late 1990s, his doctor suggested that he give cannabis a try. He was down to 72 pounds, couldn’t hold down food and was “maxed out” on morphine and opioids. Nothing eased the pain. 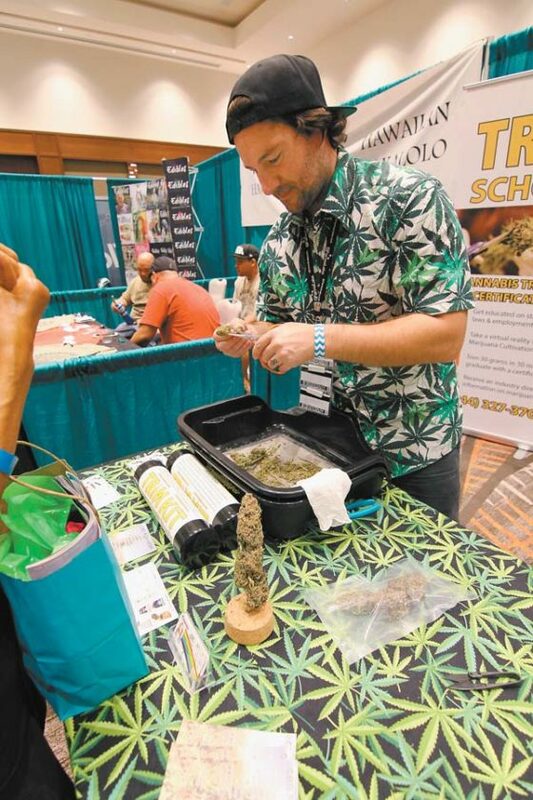 Dispensary owners, patients and supporters of cannabis pushed the benefits of the plant and tried to debunk stereotypes Sunday during the Maui Cannabis Conference at the Hyatt Regency Maui Resort & Spa. In a political environment where California allowed legal recreational marijuana and U.S. Attorney General Jeff Sessions ended a policy that gave states control over legalization in the same week, some are still hopeful for the future of medical, and perhaps recreational, cannabis. 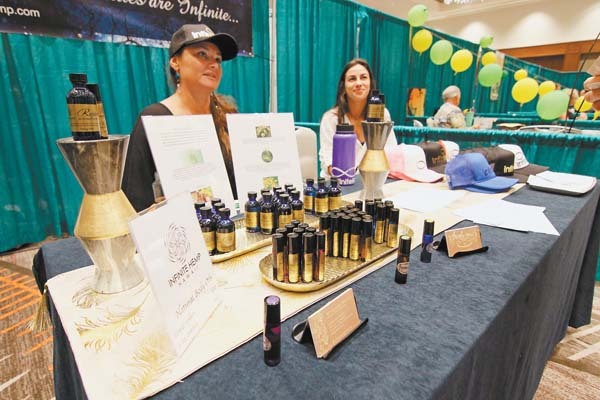 Mailani Souza (left), owner of Hawaii island-based Infinite Hemp, and Maui representative Moana Astronomo chat with passers-by about the company’s body oils infused with cannabidiol and essential oils during the Maui Cannabis Conference on Sunday at the Hyatt Regency Maui Resort & Spa. The two-day conference brought in lawmakers and industry experts to talk about the benefits of cannabis, cannabis cultivation, economic opportunities, hemp and other topics. Cannabis was outlawed, in part, “because of fake news,” Espero said. In the late 19th century, marijuana was popular in medicinal products and sold in public pharmacies, according to the PBS report “Busted: America’s War on Marijuana.” In the early 20th century, Mexican immigrants introduced the idea of recreational marijuana use to the U.S. Growing fears over marijuana-related crimes, fueled by propaganda campaigns and anti-Mexican sentiment, resulted in the Marijuana Tax Act of 1937, which taxed the sale of cannabis and “effectively criminalized” possession. In the 1950s, the federal government started to enact mandatory sentences for drug-related offenses, including marijuana. Despite cultural and legislative changes since then, Adam Lustig, chief executive officer of Higher Visions in California, said there’s still a lot of fear about “reefer madness.” Lustig said he’s worked with many veterans who have overcome post-traumatic stress disorder thanks to cannabis. An October Gallup poll found that 64 percent of Americans support legalizing marijuana, a record high since 1969. On Jan. 1, California became the sixth state to allow legal recreational marijuana. But, the same week, Sessions rescinded an Obama-era policy that allowed states to regulate marijuana without federal interference. Mark Rowland of Pono Life Sciences, one of two licensed medical marijuana dispensaries on Maui, wasn’t surprised by the move. “It caused a lot of ripple, of course, but in the end it may actually be one step closer to federal regulation and federal legalization . . . which is really the end goal as long as the states still have some rights,” said Rowland, director of cultivation for Pono Life Sciences. Medical marijuana has been legal in Hawaii since 2000, but laws establishing licensed dispensaries didn’t pass until 2015. Statewide, eight dispensaries have received licenses, including two on Maui — Maui Grown Therapies and Pono Life Sciences. Espero thinks now is a prime opportunity to decriminalize marijuana, a bill that legislators have tried many times to pass. “With dispensaries up and running, and people seeing with the dispensaries there’s not chaos and crime rampant in our neighborhoods . . . maybe this could be the year for decriminalization,” Espero said. The senator from Ewa Beach added that, in the upcoming session, the state Legislature could also consider bills on edibles, protections for employees and tenants who use medical marijuana, regulations on trading between patients and the transportation of cannabis interisland. Residents of states where marijuana isn’t legal have watched places like Colorado and Washington, the first states to legalize marijuana in 2012. Opponents have linked growing crime rates to marijuana use, while supporters argue there’s no proof of a connection. However, speakers at the conference believe that the economic benefits for these states are clear. Rowland, who supports legalizing recreational marijuana, pointed to Washington, which collected a total of $319 million in legal marijuana income and license fees in fiscal year 2017, according to an annual state report. “On an economic level, you cannot deny the revenue stream,” Rowland said.